Founder and President of Firmitas Cyber Solutions - focusing on providing a unique technological approach for the security of mission-critical infrastructure sector & Industrial Internet of Things. Brig. Gen. (Res.) Rami Efrati, an expert in Cyber Technology Strategic Methods, is the former Head the Civilian Division of the Israel National Cyber Bureau in the Prime Minister's Office. Brig. Gen. (Res.) Efrati has over 20 years of civilian experience and has been involved in entrepreneurial activities with both start-up and established companies in the Cyber-Security, High Tech and Bio-Technology sectors. Rami is a guest expert and lecturer in the Geneva Centre for Security Policy (GCSP) and a Senior Cyber Fellow in Yuval Ne'eman Workshop for Science, Technology and Security in Tel-Aviv University. Brig. Gen. (Res.) 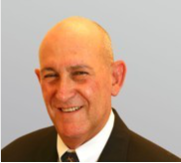 Efrati is serving the community as Past District Governor of Lions Clubs in Israel.